"Therefore we also, since we are surrounded by so great a cloud of witness, let us lay aside every weight, and the sin which so easily ensnares us, and let us run with endurance the race that is set before us. Looking unto Jesus the author and finisher of our faith, who for the joy that was set before Him endured the cross, despising the shame, and has sat down at the right hand of the throne of God" (Heb. 12:1-2). Christ - the Ideal of Perfection. In the best moments of our life, when we are inspired to live a good life, to love everyone and everything, and to do good deeds, we cannot find a more appropriate example to follow than that of our Lord Jesus Christ. The righteous men of every age - prophets, apostles, martyrs, ascetics, and other champions of the faith - all shine with the beauty of their faith to the extent that they imitate Christ. "For as many of you as were baptized into Christ have put on Christ" (Gal. 3:27; see also v. 4:19). As raindrops show different colors by reflecting the rays of sunlight, so every faithful Christian should reflect the spiritual beauty of Christ. By desiring that all our thoughts, feelings, words and deeds be directed to the glory of God, and with clear and complete love for Him arising from the bottom of our hearts, desiring to be with Him. By trying to do everything God approves of and commands, in complete obedience to Him; rejecting all He forbids, even if we must sacrifice ourselves to be faithful to Him. By living in humility, honesty, and chastity, in moral purity and blamelessness; and by working to increase our spirituality with good deeds. By compassion toward all people and their struggles, accepting their failure as our own failure, their happiness as our own happiness, and being ready to help those who are in need, even at our own expense. By cultivating love for all people - not only the ones we love and those who are good to us, but also our personal enemies - and with humility, accepting insults and injustices against us and forgiving them, as the Lord Jesus Christ forgives us. By fervent prayer: "And being in agony, He prayed more earnestly. And His sweat became like great drops of blood falling down to the ground" (Luke 22:44). For a person who retains strong ties to the world and lacks spiritual understanding, these virtues appear to be beyond one's strength. If we penetrate deeper, we can see that the essence of the difficulty lies not in the deeds, but rather in our own nature, spoiled by original sin. Indeed, the angels in Heaven live virtuously and carry out all the commandments of God naturally, without struggle and with great gladness. If we were sinless and pure, as God created man in the beginning, it would be easy and pleasing to us to live like this. But sin has destroyed the harmony between the body and the soul, the physical and the spiritual. Our body is ruled by disorderly desires, corrupted and subordinated to the tyrannical governance of our sinful nature over the soul. It is necessary to end the illegitimate rule of our body and to put it into obedience to the soul. This is easier said than done, since mankind has become enslaved by sin and the devil. Only through the Son of God, who accepted our physical nature in order to rescue us, can we be freed from sin and restored within to the likeness of God. Despite sinfulness, one should not despair. All the saints had their faults and suffered from various temptations; when they fell, they rose again through repentance. It is wonderful that with God's help, they achieved such advanced spiritual levels, gathering wisdom and experience in order to help others follow them on the road to spiritual regeneration. The Lord Himself proved that they follow the Truth by giving them gifts of miracle-working and the ability to look into the future. Poor, rich, peasants, kings, scholars, and slaves make up this pious multitude of saints, all having one thing in common: the Christian struggle (in Russian: podvig). All followed the "narrow path" created by Christ, all voluntarily abstained from the carnal pleasures offered to them, and all "have crucified the flesh with its passions and desires" (Galatians 5:24; see also Romans 6:6). Let us take, for example, the valuable and encouraging life of the Apostle Paul. Autobiographical notes are scattered throughout St. Paul's writings, giving us an understanding of his inner motivations and struggle. The mission God entrusted to him required complete self-sacrifice. Since the apostle emphasized faith so greatly, it may appear to the unknowing eye that spiritual feats are not necessary. Protestants often use him as scriptural evidence of their teaching that spiritual struggle is unnecessary since, as they erroneously believe, man is saved only by faith. And yet, according to his own words, St. Paul frequently remained "in weariness and toil, in sleeplessness often, in hunger and thirst, in fastings often, in cold and nakedness..." (2 Cor. 11:27). To keep within himself a spiritual awareness, he consistently "trained" himself with spiritual exercises, looking on his life as if he were competing in the Olympic Games. "Do you not know," he writes in his first epistle to the Corinthians, "that those who run in a race all run, but one receives the prize? Run in such a way that you may obtain it. And everyone who competes for the prize is temperate in all things. Now they do it to obtain a perishable crown, but we for an imperishable crown. Therefore I run thus: not with uncertainty. Thus I fight not as one who beats the air. But I discipline my body and bring it to subjection, lest when I have preached to others, I myself should become disqualified" (1 Cor. 9:24-27). Evidently, he lived this way because he considered himself as one not yet having attained the heights of spiritual perfection; yet he knew it was his calling to reach them. "Not that I have already attained, or am already perfected; but I press on, that I may lay hold of that for which Christ Jesus has also laid hold of me. Brethren, I do not count myself to have apprehended; but one thing I do, forgetting those things which are behind and reaching toward those things which are ahead, I press toward the goal for the prize of the upward call of God in Christ Jesus. Therefore, let us, as many as are mature, have this in mind; and if in anything you think otherwise, God will reveal this even to you. Nevertheless, to the degree that we have already attained, let us walk by the same rule, let us be of the same mind. Brethren, join in following my example, and note those who so walk, as you have us for a pattern" (Philippians 3:12-17). Undoubtedly, the Apostle Paul understood true Christianity far better than many contemporary leaders of sects do today. If he willingly enslaved himself to voluntary struggle, it is because he knew this was necessary for spiritual growth. "I beseech you therefore, brethren, by the mercies of God, that you present your bodies a living sacrifice, holy, acceptable to God, which is your reasonable service" (Romans 12:1). He wrote often to his Christian contemporaries, calling them to follow his way of life (Phil. 3:17; 2 Thes. 3:7; Hebrews 13:7). We would be spiritually perfect if we were free from the deficiencies of sin and passion, immune from any temptation, totally committed to the spiritual way of life, full of real love for God and for our neighbor, completely sinless. In this case, spiritual struggle would no longer be necessary, as it is unnecessary for the angels and the saints in the Heavenly Kingdom. In the present situation, it remains our goal to become perfect both with the help of God and personal struggle. The Apostle Peter summarizes the content of the Christian life this way, "Therefore, since Christ suffered for us in the flesh, arm yourselves also with the same mind, for he who has suffered in the flesh has ceased from sin, that he no longer should live the rest of his time in the flesh for the lusts of men, but for the will of God" (1 Peter 4:1). Here the conquest of sin is placed directly together with the voluntary crucifixion of the body with all of its passion and self-will (Gal. 5:24). It all comes down to this elementary truth: due to the sinful, deteriorated state of our nature, the soul and body remain in a constant battle. When the body is satiated, the spiritual power of man declines and becomes dull, weak, and powerless. When a man voluntarily controls and weakens his body, his spiritual strength increases. The greatest ancient thinkers discovered that spiritual reinforcement and the rejection of physical pleasure immediately increases the spiritual richness within us. The more we lose physically, the more we gain spiritually. This is why the main thrust of the Holy Scriptures is an encouragement to struggle. The life of a Christian is to imitate Christ by carrying one's cross and following Him: "And he who does not take up his cross and follow after Me is not worthy of Me" (Matthew 10:38). When the disciples asked Christ how many would be saved, the Lord replied, "Strive to enter through the narrow gate, for many, I say to you, will seek to enter and will not be able" (Luke 13:24), "...the kingdom of heaven suffers violence, and the violent take it by force"(Matthew 11:12; see also Luke 13:22-30, 14:25-27; Mark 8:34-38; John 12:25-26); "... seek first the kingdom of God, and His righteousness, and all these things shall be added unto you" (Matthew 6:33, 6:19-34). And although this is only in instances, it must be our goal in life. "Let your waist be girded and your lamps burning" (Luke 12:35; Mark 13:33-37); "Be kindly affectionate to one another with brotherly love, in honor giving preference to one another; not lagging in diligence, fervent in spirit, serving the Lord; rejoicing in hope, patient in tribulation, continuing steadfastly in prayer; distributing to the needs of the saints, given to hospitality" (Romans 12:11). 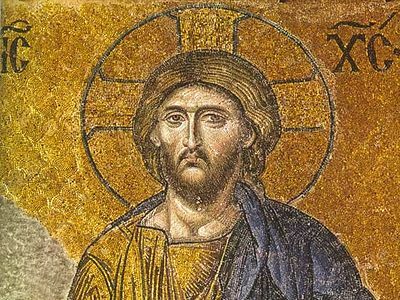 However, when we talk about the necessity of the spiritual struggle, we must remember that in Christianity it is significant that we do not have spiritual life except through the imitation of Christ. Spiritual life may be dull, evil and gloomy - the "spirituality" of demons. Hinduism with its yoga exercise allows growth in "spirituality" and some abilities of the soul; however the results are completely the opposite of the soul's salvation. Roman Catholicism, separated from apostolic teaching and tradition, has developed its own methods of "scorning the body," but its spiritual feats retain a gloomy rigidity, a life-less discipline, and a legalistic requirement far from the true goal. Christianity as an imitation of Christ is a religion of joy. Nervousness, austerity, and gloominess contradict the Orthodox understanding of true struggle. In the sermon on the mount, Christ calls men to the kingdom of eternal happiness: "Blessed are the poor in spirit . . . Blessed are they that mourn . . . Blessed are the meek . . " (Matthew 5). The greatest Orthodox ascetics always reflected in themselves a bright and happy mood. 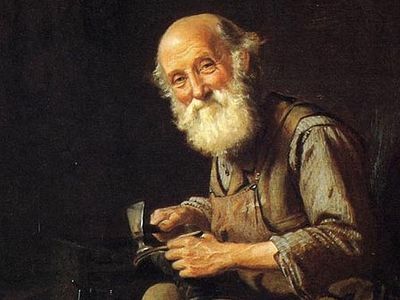 By talking with St. Seraphim of Sarov, St. Elder Ambrose of Optina, St. John of Kronstadt, St. Herman of Alaska and others, people felt peace of mind, inner comfort, and happiness. All real hermits were very strict with themselves but very lenient and pleasant to others, as we ought to be. Before us is a great goal--to be a new creation and to imitate and partake of Christ. To achieve it, one must correct oneself and break one's self-will, moving from pride to meekness; from passion to abstinence; from hot-temperedness to gentleness and hospitality; from self-centeredness and greed to compassion; from suspiciousness and jealousy to being supportive and well-wishing; from light-mindedness to wisdom in God; from cowardice and faint-heartedness to bravery and courage; all things changing for the good. God helps us in every way; however we ourselves must also actively participate in this noble endeavor. Here lie a multitude of obstacles. Often, our nature and essence contradict and act against the Christian lifestyle. This puts us in a kind of despair which the Holy Fathers called "spiritual despondency." Such temptation to despair comes from the devil. As he tempted Christ when our Lord was near exhaustion, so he tries to tempt us at the weakest moments of our lives. Cunning and insidious dragon! Therefore, "Watch and pray, lest you enter temptation. The spirit indeed is willing, but the flesh is weak" (Matthew 26:41), remembering always that "if indeed we suffer with Him...we may also be glorified together" (Romans 8:17). Prayer, attending church services, fasting, abstinence, confession, Holy Communion, study of the Holy Scriptures, spiritual reading, thinking about God, works of charity - all these are necessary means for our internal regeneration and are our footprints in following Christ. However, if we forget the goal, our means yield little benefit and can become dead attributes. We must treasure the Orthodox Church and our union with her, because she alone preserves the true, original understanding and essence of Christianity, while many so-called denominations threw away from their "Christianity" everything that seemed outwardly difficult and unpleasant. They have deprived themselves and their followers of the regenerative force of the Christian faith, leaving only pleasing external appearances and "inspirational" sayings. For the person looking for the real spiritual life, Orthodoxy alone gives all that is needed - the Grace in its sacraments and the spiritual experience and wisdom of the Holy Fathers. Though not all are called to be great achievers, through the true Faith the riches of Christ are abundantly available to all. With such riches available to us, it is tragic that many, through misguided beliefs, worldly cares, and passions, are diverted and cut off from spiritual progress and salvation. "Therefore strengthen the hands which hang down, and the feeble knees" (Hebrews 12:12), remembering that every good effort brings us closer to Christ, and that each victory over temptation is our victory with Him. We will follow victoriously the One Who said, "Take My yoke upon you, and learn from Me; for I am meek and lowly in heart, and you will find rest for your souls. For My yoke is easy and My burden is light" (Matthew 11:29-30). 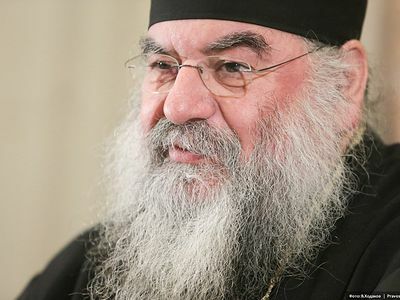 Metropolitan Athanasios of Limassol talks about end times, trust in God and the mission of Church "It is our fault that there are people who do not know Christ"
Confession is the simplest way to learn what people think about and to understand their problems or concerns. I am very happy when people view their bishop as their father. I am happy when I know that people can come to my church and find me there to tell me about their problems.